The ECONTROL range of High Integrity Pressure Protection System (HIPPS) is an engineered mechanical and electrical system by our V.E.U. engineers, designed in order to reduce the chance that the protected facility pressure will exceed the maximum allowable pressure. The protection against overpressure is obtained by immediately isolating the source causing the overpressure. The entire HIPPS package consists of initiators, a logic solver and the final element. The initiators are field sensors that are the inputs required to detect the hazardous condition. The logic solver process these inputs and generates correct outputs that change the state of the final elements in order to mitigate the hazardous condition. 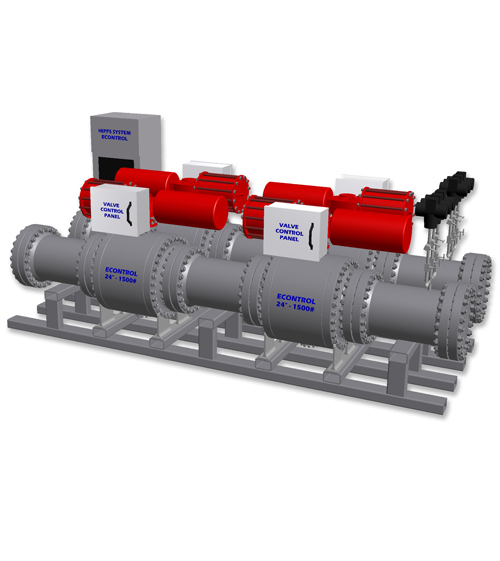 The ECONTROL HIPPS packages are used in the energy sector in order to provide pressure protection of pipelines, piping, vessels and process packages against over pressure, allowing the use of lower design pressure downstream the HIPPS.